Like this? After making the model, I would prefer something like the sticky piston in texture, at least for the default texture pack. Wow, I really like what you whipped up there! I thought about just using the sticky piston texture, but I didn't feel it would fit "logically". Like players might expect sticky pistons to perform the same way then. Great idea!What about every side "stickyness" being toggable by right-clicking? This would be pretty sweet. Full support; seems to be a great idea especially if right click to select sticky side or the ability to be placed like pistons is implemented. I like this! It's clever and, surprisingly, original! Though I do think it should only require 5 wood blocks, given that only 5 sides of the blocks are covered by the wood (and technically 99% of the wood involved is wasted already since only a very thin layer of wood is actually used). also i would suggest a trap door design for the sides instead of simple wood or slime stained wood. 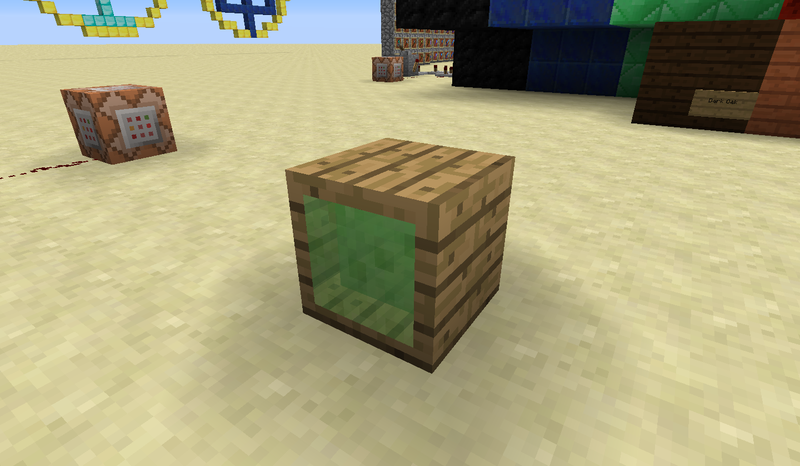 with slime blocks and trap doors already being transparent, it would look fairly nice, to see the usual slime interior through the sides of the trap door texture. another whacky idea would be to have the different types of wood give you differen types of boxed slime boxes. this way you could easily mark special blocks while building or build different colored lines/paths of boxed slime blocks. they can still connect to each other, it would be *only* a graphical thing. Hmm, that might indeed work better. Unfortunately i'm really not that good with renders. That could be useful... though Mojang seems very reluctant to give us different colored wood items.